It’s a whole new language to learn in the vineyards and caves of the Jura. And, that isn’t all. For France’s smallest wine region (around 1,600 hectares – smaller than some single estates in Chile) is undoubtedly also the most complicated. To get to grips with it requires a steep learning curve, but the effort can pay off if you have a passion for unusual flavours, intriguing food and wine matches and spectacular countryside. First, here are the basics. The Jura wine region stretches from just north of Arbois to some kilometres south of Lons le Saunier in the western foothills of the low Jura mountain range. Around 80km east of Burgundy, it makes an excellent stopover if you are driving from northern France to the Alps, or even en route to the Med. 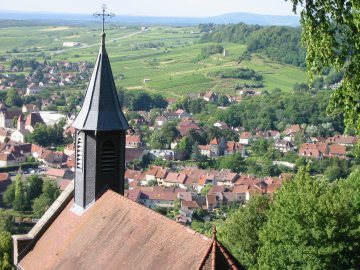 (view over Arbois, right)The Jura has a broadly northern continental climate with clay-limestone soils that include outcrops of marl in particular, with plenty of fossils. There are four regional appellations: Arbois, Côtes du Jura and the smaller Etoile and Château-Chalon, plus two wine style appellations that cover the whole area, Crémant du Jura and Macvin (a Vin de Liqueur). Five grape varieties are used today: for whites, Chardonnay and Savagnin (sometimes called by its old name, Naturé), plus Poulsard (also called Ploussard), Trousseau and Pinot Noir for reds. Colour in the Jura is often not what it seems! Whites can vary from pale greenish through to dark amber (and that includes the famous jaune or yellow), and reds are more often than not pink, or tile-coloured at best. On labels, variety is indicated sometimes, but the style of wine rarely, unless it is the famous Vin Jaune or the sweet Vin de Paille. Any style may be made under the Arbois or Côtes du Jura appellations; Etoile is restricted to whites (including Jaune and Paille); Château-Chalon is exclusively Vin Jaune, but note that in this case the words “Vin Jaune” do not appear on the label. Apparently all this makes sense to a Frenchman and is part of la patrimoine. To understand the whites, first one must learn about the mysterious Vin Jaune. From very ripe Savagnin grown at low yields, it undergoes conventional fermentation and malolactic fermentation and then, the magic starts. The Savagnin wine is transferred to old Burgundy pièces (barrels) incompletely filled and placed in the producer’s cave à Vin Jaune. Convention is turned on its head here, for these caves may be attics, cellars or simple storage warehouses, sometimes all three (for more complexity), but the essential is that they are well ventilated and subject to temperature fluctuations. It is these conditions that allow the voile or film of yeast (similar to flor in Jerez) to form on the surface of the wine. And that’s it. There the wine stays for at least six years during which, each pièce is regularly checked for dangerous levels of volatile acidity and for the formation of the beneficial ethanal, which in part provides the famous goût du jaune. The testing is done mostly by a laboratory, though a few producers taste the wines too, with the aid of the dzi or tap on each barrel, placed well below the voile. A slow oxidation will have taken place, but the voile protects it from forming vinegar. Those pièces that do not make the grade are withdrawn and the wine is sold simply as Savagnin white wine (a sort of baby or second Vin Jaune) and/or is blended with Chardonnay and sold as a white. Amongst rigorous producers, the rejection rate may be as high as three-quarters of the original barrels. Those that are retained are bottled in the 62cl clavelin and sold for prices of around €25. Good producers advise aging for at least a further decade, though the best can last centuries. The classic Vin Jaune flavours are of mild eastern spices (e.g. turmeric and ginger, as in French “curry”), walnuts and sometimes honey. 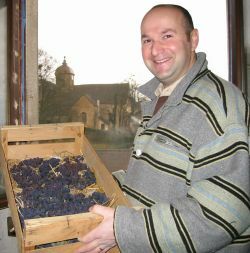 The so-called “curry” notes come from the recently discovered chemical, sotolon that also exists to a lesser extent in some fortified wines.The richest Vins Jaunes traditionally come from the spectacular hilltop village of Château-Chalon, which is home to several producers, most notably in quality Jean Macle (right) and Domaine Berthet-Bondet. Arbois, Côtes du Jura and Etoile Vins Jaunes are slightly lighter in flavour, but can be equally good. Recommended food matches are many, but for me, nothing beats the combination of a glass of Vin Jaune with a mature Comté cheese and walnuts. The Percée du Vin Jaune is an extraordinary annual celebratory weekend held in a different Jura village each February (in St-Lothain, 5th-6th February 2005). Although the weather can be difficult, people turn out in their tens of thousands for this event, which on the Sunday celebrates the symbolic “piercing” of the first barrel of the “new” Vin Jaune and its subsequent release, no less than six years and three months after the harvest. The village is decked out for a wine fête and participating producers offer their ranges to taste, including their Vin Jaune. It is an ideal way to discover these local wines in a great atmosphere. The most straightforward style made in the Jura is Crémant du Jura, a traditional method sparkler usually from 100% Chardonnay (though some reds may be blended in) and generally of a very credible quality, at least as good as most Crémant de Bourgogne. The dominant flavours are of soft apples and it makes a delightful aperitif, offering excellent value. Chardonnay is the Jura’s most planted variety and the growing success of Crémant seems to have benefited the quality, because any unripe grapes go for the sparkling base, leaving the riper stuff for the whites. A traditional Jura Chardonnay (the words Tradition or Typé are sometimes noted on labels and wine lists) is an acquired taste to outsiders. It will have been aged in old pièces and may have formed a slight voile, so displays distinct oxidative notes. If the thought of this abhors you, avoid Côtes du Jura and l’Etoile whites unless you know the producer. Arbois Chardonnays are mostly matured fully ouillé (essential vocabulary in the Jura, meaning that barrels, foudres or tanks have been regularly “topped up”, preventing oxidation). Chardonnays matured in old foudres have been a revelation to me, as even bottled three years after the vintage, they taste as fresh as a young wine and age extremely well thereafter. Flavours are like old-fashioned, but good Burgundy, with little oak influence, and they make wonderful food wines. Daniel Dugois makes some excellent cuvées. There are modern Chardonnays also being made now in the Jura, fermented and matured in new or fairly new oak and sold somewhat younger. Much disapproved of by local traditionalists, they can demonstrate a superb minerality, seemingly really expressing the fossil-rich soils of the area. For a taste of these, look out for Chardonnays from Alain Labet or Jean Rijckaert, both exported.The term floral or names beginning with “Fleur de” are used informally to indicate the ouillé whites of the Jura and these may be 100% Chardonnay, a blend with Savagnin, usually 25 – 50%, or less commonly and a recent phenomenon, 100% Savagnin. The blends can be surprisingly good, but can also fail dismally. The lemony acidity of the Savagnin should streak through the round, slightly nutty Chardonnay character, but too often an oxidized character still creeps through. Causing most controversy is a new breed of non-traditional ouillé Savagnins that allows the real freshness of the grape to shine through. For too long, the taste of deliberately oxidised styles of whites has been put down to the character of the Savagnin or the terroir. With these new styles, we are finally discovering what the grape tastes like with an almost lemon peel character and potentially raging acidity, that can be perfectly balanced as long as the grapes are picked fully ripe. Confusingly, Jura reds are sometimes labelled as rosé, because of their pale colour, even though the tannins evident on the palate make it obvious to any modestly experienced wine taster that the wines have been vinified as a red. Other names, such as Rubis (recommended by the regional comité) or Corail are seen around too. The unusual 2003 vintage allows Jura reds for once to be – well – red. The Poulsard grape is the palest and has a curious nose being very easily prone to reductive smells, but when drunk with the local charcuterie or smoked sausages to cut through its high acidity, the purity of red fruit somehow gets brought to the fore. Trousseau, which thrives in the north of the region around Arbois, can provide slightly more colour and often gives a nose combining gameyness with redcurrants. It is traditionally matched with game. And, then there is Pinot Noir, which comes into its own in the far south of the region, where soils are more similar to Burgundy, with more limestone than clay – Jean-François Ganevat who worked ten years in Beaune makes an excellent example. All three red varieties may also be blended. Reds are traditionally aged in foudres or simply in tank, and, another Jura confusion here, they are sold at a younger age than the whites! Vintage 2003 allows the more daring producers to really bring out the ripe fruit characters in all the varieties, and an opportunity to be bolder in their use of barrel ageing. Catch them soon, sales locally are growing and many are already on release, due to the low acidity of the year. Poulsard is put to better use in my view as part of the blend for Vin de Paille, together with Chardonnay and Savagnin – the red grapes can give a copper hue to the wine. Grapes for Vin de Paille are picked early and then dried usually in an attic area, either in small boxes, or suspended from the rafters. Once the requisite sugar has been achieved, they are pressed, normally in January, but in 2003, when the grapes were picked in the 3rd week of August, they were pressed as early as October. By law the wine must be oak-aged for a minimum of three years. Many vignerons seem loathe to make a really sweet wine, perhaps because these wines are traditionally drunk in France as an aperitif, whereas in the UK, we might prefer them with dessert if they were sufficiently sweet. Vin de Paille laws are very strict, limiting experimentation by growers, yet, the styles still seem to end up hugely varied. The best have haunting honeyed flavours with delicious, candied exotic fruits and excellent balancing acidity preventing them being too top-heavy in alcohol (they are minimum 14.5% by law). There is a growing band of good growers in the Jura. 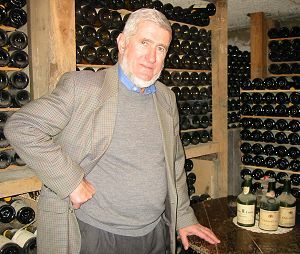 One leading light to look out for is Stéphane Tissot of Domaine André et Mireille Tissot, who also runs his own négociant business, Les Caves de la Reine Jeanne. If you are visiting Arbois (a great base for a few days Autumn holiday), there are several tasting caveau/shops in the middle of the town including the notorious Henri Maire (try the old Vins Jaunes, but forget the rest), the reliable Rolet, A & M Tissot, Domaine de la Tournelle, Jacques Tissot and others. (left, Stéphane Tissot with grapes drying for Vin de Paille).Look out too for an independent wine shop, Les Jardins de St-Vincent, run by Stéphane Planche, the sommelier of the excellent Jean-Paul Jeunet hotel and restaurant, and a great champion for some lesser-known producers. But, to really uncover the mystery of the wines of the Jura, you must explore the caves of the vignerons in villages such as Montigny-les-Arsures, Pupillin, Le Vernois and Rotalier, and be prepared later to wash the wines down with some hearty mountain fare in the local restaurants.